Today is the Gay Pride Parade in Toronto. The joke continues with the observation that some “Christian conservatives,” identifiable as libertarians in the private sector and authoritarians in other people’s private lives, are also regularly discovered to be deeply in the closet, sometimes in the company of a rent boy and a ready supply of crystal meth. This includes pastors of “family values” churches and a striking number of Stephen Harper’s Republican brethren. So nobody is suggesting that our God-fearing, End Times-friendly prime minister is anything but what he appears to be. However, according to the demands of the joke, he does exhibit eyebrow raising behavior. Most notably, a conspicuous streak of homophobia likely related to some unresolved conflict that dare not speak its name, but is expressed by an obsessive concern with restricting the sexual behavior and personal freedoms of people who do not conform to his version of “real Canadian values.” Think of the secretly cross-dressing J. Edgar Hoover’s paranoid fantasies about “the enemy within” — in the end it was clear who the “enemy” and where the “within” was. Finally, there’s the punchline involving Harper’s billion dollar G20 Sweet Sixteen last June: all those sweaty, heavily muscled, body armored, nightstick swinging riot police “kettling” legally assembled protesters, pushing up hard against them from behind, thrusting deeper and deeper into the crowd . . . Very butch. Totally top. However, joking aside, does any of this sound anything like what Jesus would do? Or is it a projection of what Harper’s Jesus would do if he actually existed, passing judgment and casting aside those who do not qualify as somehow fulfilling God’s love? It’d be hard to go wrong with the assumption that any God of love worthy of the name loves gay people and would have some stern (but still forgiving) words for the odd over-compensation of our jet-buying, jail-building prime minister. 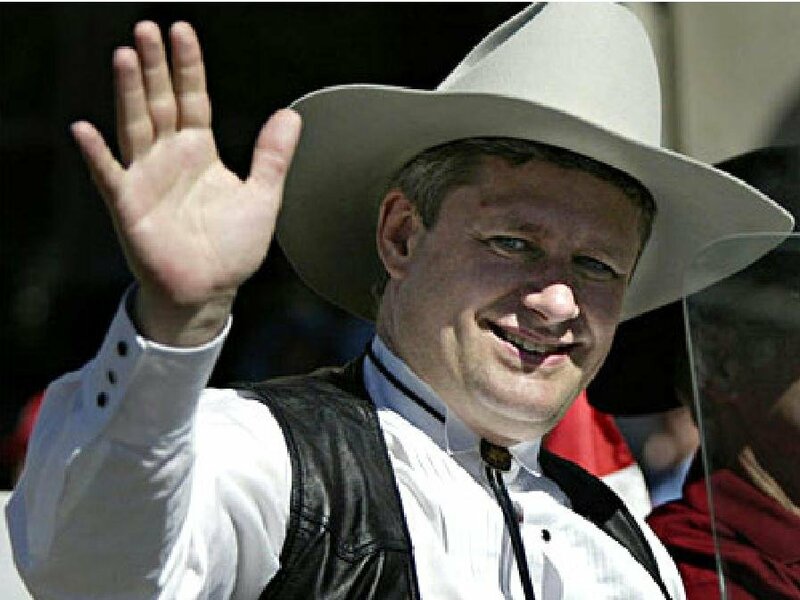 There’s not a lot of peace or love in Harper’s Christianity, which means it could use a little more Jesus and a lot less idolatry, such as worshiping the golden calf of corporate power and Mammon in general. All of which raises the very serious question: what exactly is Stephen Harper afraid of? Gay Pride exhibits both pride and courage. Harper seems to possess neither. Except maybe the hollow courage of those who have acquired worldly power for personal gain, which is in turn closely related to the pride that goeth before the fall. This entry was posted in Current Events, Frye on God, Sexuality on July 3, 2011 by Michael Happy.